The Davies Report has been an extensive review of the options for London airport expansion. It has taken years and looked at heaven knows how many documents from innumerable interested parties. It falls squarely into one of my unfailing rules of thumb as a city analyst, which was that the longer and more detailed a report, the greater the likelihood that its conclusions were plain wrong. I have no doubt that Davies was swayed by the sheer weight of in its favour that Heathrow undoubtedly brought to the commission until he lost sight of fundamental factors and recommended the third runway at Heathrow. In my view, Davies has come up with the worst of the conclusions that he might have reached. Thankfully there is a let out in that the Government has not bound itself to follow blindly his recommendation. In contrast, I commend the hard work and sound common sense of the Council’s H&F Heathrow Committee, which came to a different conclusion. On a pure business case, I am sure that Heathrow expansion makes excellent sense with its existing connections and infrastructure, ease of access, existing customer base and established workforce. Clearly its expansion is far cheaper than starting afresh elsewhere. But the objections to Heathrow expansion are not about business, and the decision is very far from being a pure business case. The single biggest objection is about noise. There are clear allegations that the commission played down the environmental and noise impact of an expanded Heathrow. Noise directly affects people’s health. It also deprives them of sleep and sleep deprivation and disturbance has a significant impact on someone’s mental and physical health. These factors are difficult to measure, easy to downplay, but of paramount importance to the well being of west Londoners and the residents of this borough. The northern runway at Heathrow will greatly increase the number of people suffering from this – bringing with it a flight path that goes down the Goldhawk Road rather than the river. The severe curtailment of flying times and prohibition on night flights suggested by the Davies Commission is far from being a satisfactory answer. Planes do arrive late, or early. Five or six in the morning is a period of very deep sleep for many Londoners. Major hub airports worldwide operate 24 hours – with time differences and long haul flight times it is difficult not to. The pressure to extend flying times at Heathrow will be immense, and the expansion of much needed long haul destinations, particularly to China, will increase this pressure. Another major objection is safety. It does not make sense to have the major flight path of a major airport directly over the centre of a major global city. If you were starting with a clean slate, no way would anyone put a hub airport just west of central London. We concede the need for expanded capacity that can be brought on stream in fairly short order. Our preference is for a second runway at Gatwick and enhanced connections between the two airports, or, failing that, for the westward extension of the existing runway at Heathrow. But these are still relatively short term fixes. Longer term, I believe we shall be building a major hub airport somewhere in the Thames estuary. Other cities have taken such bold decisions and I trust that at some stage we shall gather enough courage to do the same. Meanwhile, I am pleased that the Council is unanimous in rejecting the Heathrow third runway proposals. The Mayor of London Boris Johnson has described the Airports Commission decision to recommend that a third runway be built at Heathrow as highly predictable, short-termist and completely politically undeliverable. He was astounded by their recommendation that there be a legislative ban on a fourth runway, a ban that the Mayor believes absurd as no Parliament can bind its successors and can be considered even more ludicrous given that the report published by the Commission today says a further runway will be required by 2050. It only makes even clearer the inevitability of proposals for a fourth runway at Heathrow, which would offer even greater noise pollution and fumes over west London. The Mayor also described pledges to cut aircraft noise made in the report published by the Commission this morning as hokum. In their report the Airports Commission proposed a ban on night flights that does not cover the entire night period. They propose a ‘noise envelope’ with no information on how that would be measured and they propose an independent noise authority that would be a statutory consultee, not a regulator, effectively rendering it toothless. The Commission’s report also makes grand promises of noise compensation – but that in reality would provide insulation for less than 200,000 homes – a fraction of those exposed to noise pollution by a third runway at Heathrow. The Mayor’s team also criticised the Commission for making a recommendation that would expose over a million people to aircraft noise, with dire consequences for their health. Studies have shown that the risk of stroke, coronary heart disease and other cardiovascular disease increases by 10 to 20 per cent in areas plagued by aircraft noise. Aircraft noise is also linked to significantly reduced reading comprehension and memory recall in school children. Beyond noise, a third runway’s impact on air quality is also a serious environmental and public health concern. The Airports Commission’s own analysis shows that a third runway would make Heathrow the worst air quality black spot in London by 2030. That would not be compatible with the UK’s obligation to meet EU air quality targets and would fly in the face of a recent ruling by the Supreme Court that ordered the Government to make plans to tackle air pollution. Quite incredibly, despite acknowledging the importance of aviation links to the UK economy and that Heathrow already operates at 99 per cent of its capacity, the Airports Commission recommendation that a third runway be built would only provide enough capacity to deal with the increase expected over the next 15 years and completely fail to address the future demand for aviation capacity. In 2013 the Commission’s own analysis found that a three-runway Heathrow would be 80 to 90 per cent full shortly after opening and therefore without the resilience required to operate the airport reliably and effectively. A three runway Heathrow would essentially suffer from the same problems of the two-runway Heathrow today, an airport which struggles with any sort of weather disruption, where many new routes to emerging economies cannot be started and valuable links around the UK are squeezed out. “This highly predictable report offers a short-termist recommendation that would be judicially reviewed from here to Kingdom come and is completely politically undeliverable. Heathrow already contributes more to noise pollution than any other airport in Europe and the Airports Commission’s pledge that noise can be reduced there is quite frankly hokum. By recommending expansion at Heathrow the Airports Commission have only prioritised the short term and private interests of the large corporations controlling Heathrow and they have entirely missed the opportunity to plan for the wider development and planning challenges faced by a city where the population is forecast to increase by 37 per cent to more than 11 million people by 2050. The Mayor’s team have also highlighted a wholly inadequate approach by the Airports Commission in their consideration of the costs and provision of new surface access to Heathrow. The expansion proposals at Heathrow rely heavily on new schemes – notably Crossrail and the Piccadilly Line Upgrade – which been designed to meet the existing level of passenger demand, not for an expansion at Heathrow. The Commission has also taken an approach that favours parts of the road network that are already or soon to be at capacity – on the basis that someone else will solve the capacity problem. The result is that these proposals would place severe strain on already congested road and rail corridors; and increasing gridlock on the M25 will only exacerbate air quality problems. It is also clear that the Commission have severely underestimated the cost of the extra surface access improvements that are required, potentially by as much as £15bn. Heathrow is the worst airport for noise in Europe, accounting for 28 per cent of all those exposed to airport noise in Europe (at 55db Lden) – more than its five main rivals combined. Studies have shown that the risk of stroke, coronary heart disease and other cardiovascular disease increases by 10-20 per cent in areas plagued by aircraft noise. Studies in West London have linked aircraft noise to significantly reduced reading comprehension and memory recall in school children. 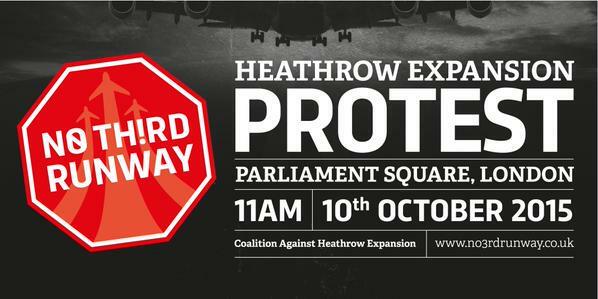 In 2030, with a third runway, Heathrow will be the worst NO2 blackspot in Greater London. The scale of the increase, in some cases as much as 12 µg/m3, would require a level of mitigation previously unheard of (without major scheme redesign). The Airports Commission has failed to quantify the benefits of any potential mitigation measures – and so have failed to demonstrate that an expanded Heathrow can meet EU limit values. By recommending expansion at Heathrow the Airports Commission have only prioritised the short term and private interests of the large corporations controlling Heathrow. Heathrow Airport is owned by Alinda Capital Partners (United States), Caisse de dépôt et placement du Québec (via Britannia Airport Partners) (Canada), CIC International (via Stable Investment Corporation) (China), Ferrovial Group (Spain), GIC Special Investments (via Baker Street Investment) (Singapore), Qatar Holdings (Qatar) and the Universities Superannuation Scheme (UK). Airports Commission analysis shows Heathrow will be full in 2030, shortly after opening a third runway: operating at 80-90 per cent capacity, it would suffer from the lack of resilience in the face of disruption that plagues the airport today. Insufficient capacity will mean inability to launch new routes to key markets in emerging economies – and vital connections to UK regions being squeezed out. The Airports Commission have identified a significant capacity gap in 2050, but do not address this. Instead they focus on runway options to 2030 rather than a long term plan for the UK. TfL’s noise modelling shows that the only result of a new runway at Heathrow will be a substantial increase in the number of people exposed to noise, and that this is the inescapable result of flying more aircraft over a city that recently reached a new record level of population. The Airports Commission approach has failed on several fronts and it will now be for the Government to give very serious thought to plans that would provide us with a hub airport with the capacity to get even larger. Very little effort was made to reach out to the general public by the Airports Commission consultation. Only two discussion sessions were held, one at Heathrow and one at Gatwick, which as ticket-only events effectively limited access for the public. Two short two hour drop in sessions received limited publicity and one gave people barely two days of notice. While the Airports Commission flies the UK up a blind alley the rest of the world is already building new runways and terminal buildings that are designed and built using British expertise and which will put them well ahead of the UK in the race for new global business. By restricting their consultation to expansion plans at Heathrow and Gatwick they have only prioritised the short term and private interests of the large corporations controlling our airports; and they have entirely missed the opportunity to plan for the wider development and planning challenges faced by a city where the population is forecast to increase by 37 per cent to more than 11 million people by 2050. Figures from Oxford Economics illustrate that in 2050, the air service connectivity available at a new four runway hub airport in the Thames Estuary would underpin £92.1bn of national GDP each year. By comparison, the inferior connectivity on offer at a three runway Heathrow would generate £59.1bn. In rejecting the possibility of a new airport, the Commission turned its back on the rapidly growing population of London. That population desperately needs the homes and jobs that an Estuary proposal offers. The regeneration of east London and the Thames Gateway, entirely in line with current Government policy, would transform the south-east and create 336,000 jobs across the UK, whilst contributing £92 billion annually to UK GDP by 2050. A regenerated site at Heathrow could provide homes for up to 190,000 residents and as many as 90,000 jobs. Without a four runway hub airport it is clear that cities around the UK whose airports have already lost their connection with Heathrow, will fail to get it back as a third runway will be full from day one. 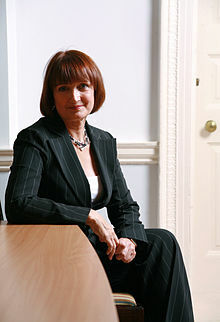 Andrew Slaughter, the Labour MP for Hammersmith, has made an astonishing attack on Dame Tessa Jowell, the front runner to be the Labour candidate for Mayor of London. 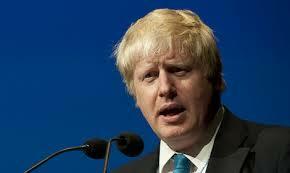 He says she is unelectable given her support for a third runway at Heathrow. There are a couple of problems. First of all Mr Slaughter’s preference is for his fellow lawyer Sadiq Khan. But Mr Khan has been completely duplicitous on the issue. Another difficulty is that Mr Slaughter has failed to convince most of the local Labour councillors in the borough. Of the 26 Labour councillors so far 16 have signed up for Toxic Tessa. Just how serious is Labour in Hammersmith and Fulham to opposing a third runway? They seem to be at each other’s throats. “We should not play politics with this issue. Sadiq was for Heathrow expansion in 2008. He was for it when he was Transport Secretary in 2009. He was for it on the Sunday Politics just a few months ago. Zac Goldsmith announces he running and suddenly Sadiq is against it. Who would get woken up by a third runway at Heathrow? 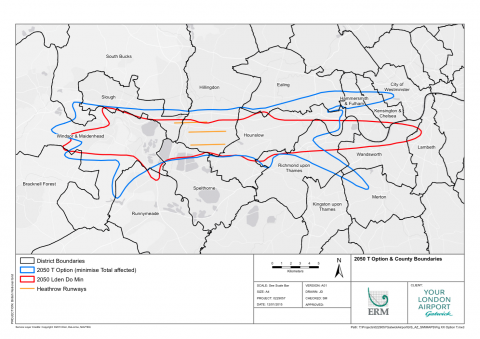 Gatwick Airport (who do, of course, have a vested interest as they want to have a new runway) have produced this interesting map indicating that 320,000 west Londoners would suffer from more noise if the third runway went ahead at Heathrow. “People living in the area outlined in red will be most affected by noise in 2050 with a two runway Heathrow. People living in the area outlined in blue will be most affected by noise in 2050 if Heathrow builds a third runway. Populations living in the areas between the red and blue outlines will be newly flown over should Heathrow build a third runway. “I’ve been having some very enlightening conversations with the technical team about this. The northern part of your ward, from just below Goldhawk Road, all the way across to the eastern edge will be impacted by noise at a higher level than currently experienced, under the first of the suggested flight paths. “Other wards including Hammersmith Broadway, Addison, Avonmore & Brook Green, Shepherds Bush Green, Askew, Wormholt & White City and College Park & Old Oak will be impacted too. “The existing flight paths already show that all of H&F south of the A4 experiences noise levels above 55db, which the 2M group has maintained to be a serious nuisance for some time.